Two students spent fall semester in Washington, D.C., working at internships awarded by the Washington Center Internship Program. Colleen Anderson, a senior majoring in paralegal studies with a focus in litigation, was an investigative intern with Public Defender Services for the District of Columbia, an organization that promotes and provides quality legal representation to indigent adults and children facing a loss of liberty in D.C.
Emily Grubbs worked for Amnesty International during her internship through the Washington Center. Emily Grubbs, a senior with a dual degree in English literature and law and social thought, was an intern with Amnesty International USA in the Gender, Sexuality and Identity Program, the world’s largest grassroots human rights organization working to make sure all people are able to live in dignity, safety and freedom. After finishing their internships in December, both students were honored at the Washington Center commencement. Anderson won the award for academic excellence for demonstrating intellectual curiosity and offering thoughtful contributions during the Leadership, Engagement, Achievement, Development Colloquium and evening course, while Grubbs won the award for civic engagement for displaying initiative, care and concern in efforts serving the D.C. community. During her internship, Grubbs developed materials to be used in campaigning activities, advocacy discussions and public education to conduct qualitative research on intersectional identity issues and rights violations targeted at people because of their identity; to analyze emerging areas of relevant global and national law and government policy; and to rank the progress of legislation in the U.S. Congress and identify key legislative opportunities. 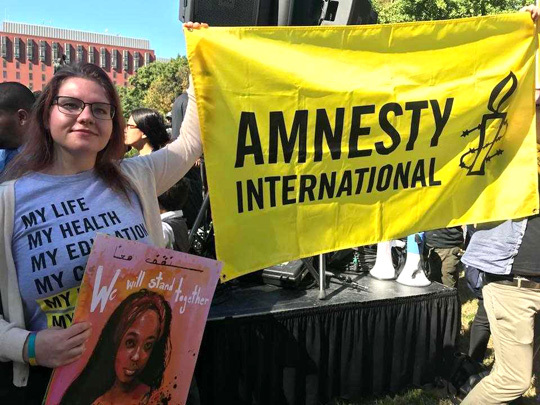 She also had the opportunity to work with Amnesty’s Board of Directors to lobby Senate offices for the organization’s top human rights concerns. 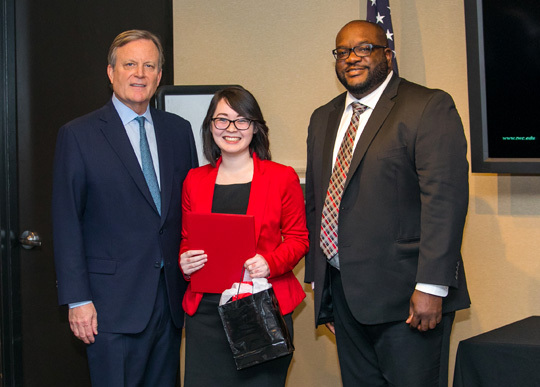 Colleen Anderson received an award for academic excellence from Chris Norton, president of the Washington Center, left, and Sherrod Williams, director of academic internship programs at the Washington Center. Anderson assisted in the investigation of cases, including interviewing witnesses and taking statements, photographing crime scenes, reviewing evidence, conducting social media research, and writing memorandums for attorneys. She also had the chance to attend hearings and court events with attorneys, even having the opportunity to testify in court on one occasion. “I really appreciated that this internship forced me out of my comfort zone,” Anderson said. “I can sometimes be reserved when meeting new people, and this internship thoroughly cured me of that after a few days of going door to door knocking and asking questions or interviewing strangers, I got much more comfortable with the process. “Although it was a challenging internship, I believe strongly that sometimes the best experiences are ones that push you to grow, and my internship with the public defender’s office certainly did that for me,” Anderson said. Both Grubbs and Anderson received grant money from UT as well as the Washington Center Internship Program to help pay for living expenses. The Washington Center Internship Program helps provide internships in D.C. for students from a variety of academic disciplines and is offered each semester to students from all over the world. Students who participate receive college credit as well as experiences they can carry with them throughout their professional careers. This entry was posted on Friday, March 9th, 2018 at 3:02 am and is filed under Arts and Letters, Features, Health and Human Services, News, UToday .